The flow of subscriber in this model, is “FROM Aweber TO DAP“. User gets added to Aweber first, then arrives at DAP via Aweber “thank you page”, at which point she gets added to DAP. Now, if the flow is from DAP-to-Aweber, and are using email parsing to integrate DAP and Aweber, then your Aweber list will always be double-opt-in (as per Aweber policy, nothing to do with DAP). But if you want your Aweber list to be single-opt-in, or you want your sign ups to be added to Aweber first and then to DAP, then use this flow. HEre, you can use an Aweber signup form on your squeeze page (instead of the DAP sign-up form) and then have Aweber add users to DAP. NOTE: You cannot use this flow for Paid members – because paid members will need to have paid first, which means DAP needs to process their payment first, and if successful, it can add them to Aweber. So for paid members and paid content, always use the other DAP-to-Aweber flow. But for free signups (say, like when you’re trying to build a list), you can add them to Aweber first using the flow explained below, just so you can take advantage of making your Aweber list single-optin, and then have Aweber add the subscriber to DAP on the other end. So this way, DAP can then create a free account for them, email them their login/password, and give them access to the “Free” content (that is, content available only to “Registered” users, so to speak), etc. 1. Go to DAP Dashboard > Products > Manage page. If your Aweber list is single-optin, then follow the steps below. If not, skip ahead to “Aweber List Is Double-Optin” flow further below. 5. Now login to your AWeber account. 5A) From the “Current List” drop-down, select the list that you wish to sign up users to. 5B) Click on “Web Forms” in the menu at the top. 5C) Edit existing form by clicking on the name of the list. 6. 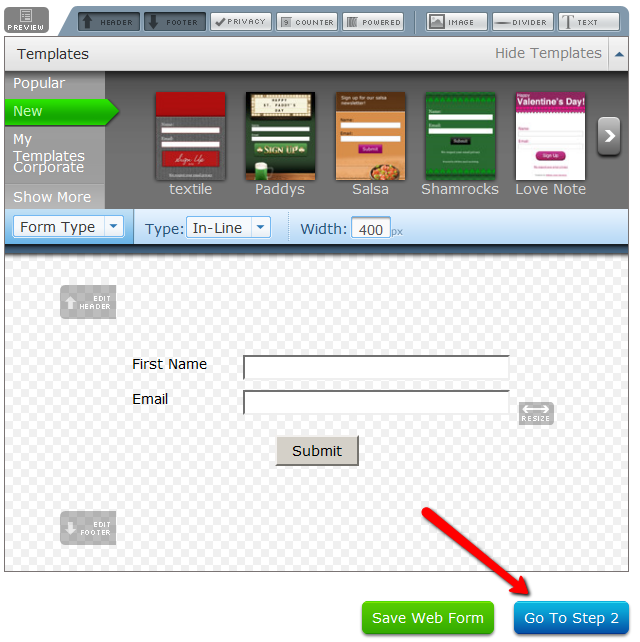 On the next page – the list form generator page – click on ‘Go to Step 2’ towards the bottom of the page. 7A) Click on the thankyou page dropdown and select ‘Custom’. Replace PRODUCTID with the Product Id of the product you noted in step 2. 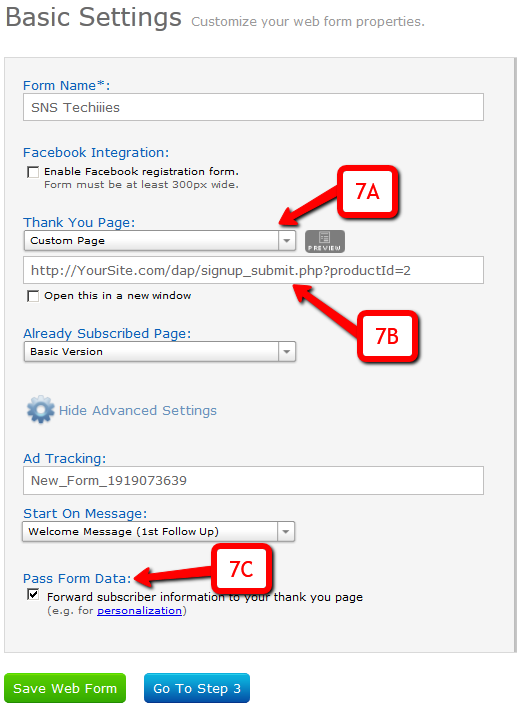 7C) Where it says “Pass Form Data”, check the check box so that Aweber can “Forward subscriber information to your thank you page” – which essentially is DAP, so that DAP can add the subscriber to your membership site. In this flow, set up your Web Form as usual, with no DAP-specific settings required. Only change required is in the Aweber list’s main “List Settings” page. 6. From the “Current List” drop-down, select the list that you wish to sign up users to. 9. Scroll down to “3: Success Page“. 9B) Check the check-box that says “Pass subscriber info for personalizing this page”. Ignore the comment that says “Not recommended for WordPress users”, because this is going to point to a DAP script, and not a WordPress page. 9C) Click on “Save Settings”. (instead of DAP’s “Direct Signup Form”). Now, every time a subscriber signs up via the Aweber form, they will automatically be added to DAP. 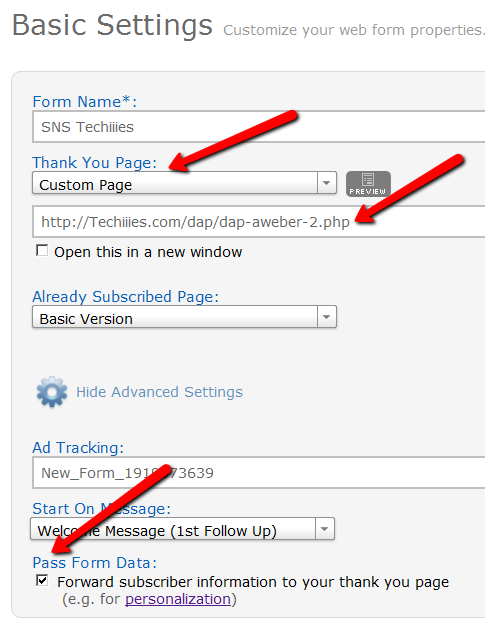 If your list is single-optin, then the subscriber will be added to DAP instantly after sign-up. If your list is double-optin, then the subscriber will be added to DAP only AFTER they’ve clicked on the Aweber double-optin confirmation link. In both cases, if they’re a new user to DAP, they will be auto-logged in to the member’s area. You may also configure the DAP Product’s “Welcome Email” to send out the DAP email and password via DAP itself. You can leave the Welcome Email in DAP Product page as blank. And then configure DAP to generate a default password (DAP Admin > Setup > Config > Default Password) as shown below, and then enter that same pre-chosen password in to your very first Aweber follow up email that goes out to your subscribers, so that they can receive their dap id/password details directly from your Aweber list. For more details about this default password, please see this post. Yes, this can be achieved by enabling the “Double Optin” for a product. So, normally, when a DAP Product is made “Double Optin” by entering the double-optin subject and email text on the “Email Notifications” tab of the product, and a user signs up for this product (whether as a free sign up or as a paid purchase or Admin-add), DAP will send them the content of this double-optin email first. And usually, the body of this email would contain the %%ACTIVATION_LINK%% merge tag, which would become the confirmation link that the user has to click on first, before their product access status becomes “Active” (from “Inactive”). And as soon as the user clicks on the confirmation link, their product status becomes active, and then the “Welcome Email” is sent out right away, and now the user can log in and start accessing the content that is protected as part of that product. “Thank you for your purchase/signup. Your account needs to be activated by us. So appreciate your patience while we do so”. Now, their account remains at “Inactive” status. And only you, the DAP Admin, can activate it. By now, you would’ve gotten the admin notification email for this person’s signup. So you know their email id. If not, you can just go to DAP > Users > Manage and you’ll see all inactive users. You would then click on “Modify” to activate product access. And if the user status is also “Inactive”, then you would edit the user info, and change their status to “Active” (from “Unconfirmed”). And then make sure you’ve added an autoresponder email (that contains the user’s email and password – insert mergecodes %%EMAIL_ID%% and %%PASSWORD%% into the email) to go out on Day #2 for that product. And assuming you will be approving this new user at some point within the first 2 days, the autoresponder email for day #2 will get triggered within the hour as soon as you activate their account, and the user will get their welcome email. Or you can send them the password in the double-optin email itself, but tell them that they won’t be able to log in just yet until their account is activated. It’s all up to you – DAP is as flexible as you need it to be. So that’s how you would use the Double-Optin feature to indirectly force an “Approval” process. As a courtesy to our customers, we offer a free installation service, where we will install DAP on your site for free. And we can do your free installation within 24 hours of your purchase. However, many people are confused by what “Free Installation” really means. So this article is to give you more details about that. To give you a real-world example, think of “DAP Installation” similar to “Delivering the boxed TV set to your doorstep”. That’s it! We won’t take it out of the box, hook it up to your cable box, set up your channels, set up your DVR, hook up your game console, DVD player, Roku box, etc. All of those things fall under “Setup & Configuration”. So if you want our help setting up your DAP site, then check out our “Membership Site In A Box” package that comes with “Concierge” sessions to help you set it all up. We will setup the Cron job(s) for you within your web hosting cPanel. If we see any hosting related configuration or installation issues, we will do our best to resolve them, if they are even resolvable (99% of the time, they are). We will then send you your new DAP Admin Email id and Password via the same support ticket you opened for installation. That’s it. There’s nothing else involved in the free installation that we perform. Hope this helps clarify what you’re getting as part of your purchase. If you want us to do it all for you, then check out our “Membership Site In A Box” package that comes with “Concierge” sessions to help you set it all up. To get your first free installation, click here. Problem: Someone buys a product from your site, and you can see in the DAP “Manage Users” page that they have been added as a user, but that user never gets an email with their login/password. All they get is the confirmation email from the payment processor. 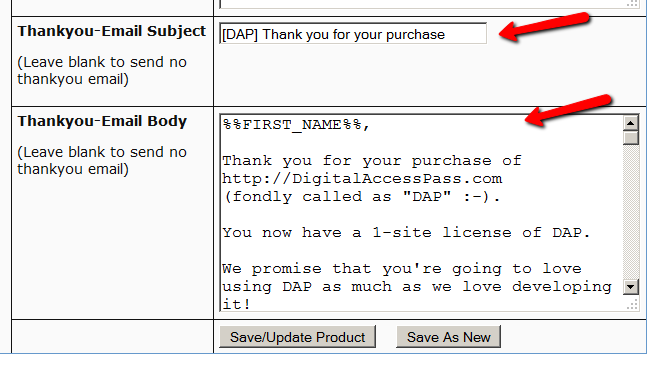 For that product, you did not set the ‘thank-you’ email subject/body in the DAP Products Page. 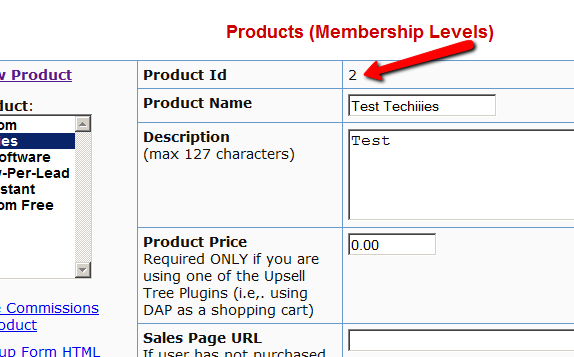 Select the product in DAP products page and set the thank-you message content as shown below. You have set up the thank-you email message, but the email still did not get delivered. The only time the Welcome Email is sent, is when a user is given access to a Product for the very first time. If you are trying to add a user to a product, and the user already has been given access to the product, then it won’t send out the welcome email the second (or subsequent) time(s). So make sure the user you’re testing with does not already have access to that Product. If she does, then remove access to the product before testing again. 1) Setup dap to generate default password (dap setup -> config -> advanced) and instruct users to change their password right after they log in. 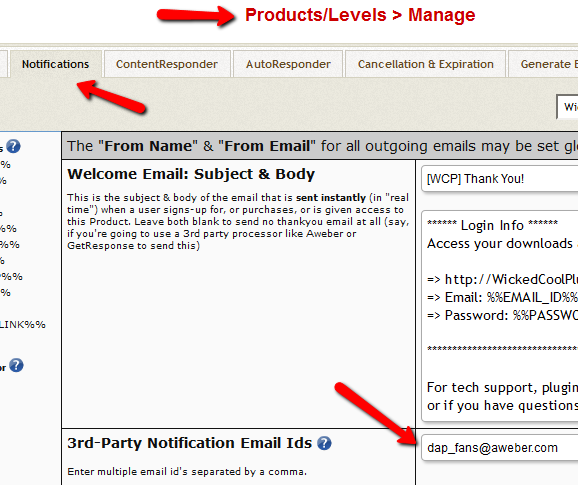 2) Set up an autoresponder email in DAP to drip day 1 with the merge tag for login id/password. So even if the thank-you email is not delivered right after purchase, when the cron runs at the top of the hour, it will send out the id/password again.. in case they did not receive it the first time. You can have dap connect to 3rd party smtp service like AuthSMTP.com to send out all autoresponder/broadcast emails for better email deliverability. The only time a new user shows up with the status “Unconfirmed” is if you have “Double Optin” turned on for that product to which he just got access. When you have double-optin turned on, then their initial status is “Unconfirmed” because you want them to click on the “Double Optin” link and confirm their intent to get access to your product, after which their status is automatically changed to “Confirmed”. So to make sure Users are always created with “Confirmed” status, just remove all text from the “Double Optin Body” and “Double Optin Subject” of the Product in question. If your product is a “Paid” product, then obviously, you don’t want people who just bought your product by filling out a shopping cart, to have to go through another double-optin confirmation process. So for paid products, you should probably not force double-optin. Double-optin is best when you’re signing up free users for a free product via the DAP Direct-signup Form. Follow this documentation page for Aweber-to-DAP integration only if you’re using DAP 4.3.1 or older. But if you want your Aweber list to be single-opt-in, then you can use an Aweber signup form on your squeeze page (instead of the DAP sign-up form) and then have Aweber add users to DAP. Please note that you cannot use this flow for Paid members – because paid members will need to have paid first, which means DAP needs to process their payment first, and if successful, it can add them to Aweber. So for paid members and paid content, always use the other DAP-to-Aweber flow. 3. There is a file called dap-aweber.php in the dap folder. Make a copy of that file and call it dap-aweber-PRODUCTID.php. Replace with the text PRODUCTID with the actual Product Id you noted in the previous step. So in the example above, Product Id is 2. So the name of the file copy should be dap-aweber-2.php. 4. Open this file (dap-aweber-2.php). Upload this file back to /dap folder on your site. If your Aweber list is single-optin, then follow the steps below. If not, skip to “Aweber List Is Double-Optin” flow further below. 7. On the next, page…. Replace PRODUCTID with the ProductId of the product you noted in step 2. 9. Scroll down to “3: Success Page“, and enter the URL of the special dap-aweber-2.php script (or whatever the file name is) you created back in Step #4 above. Check the check-box that says “Pass subscriber info for personalizing this page”. Ignore the comment that says “Not recommended for WordPress users”, because this is going to point to a DAP script, and not a WordPress page. Now that you’ve set up DAP to integrate with your Aweber list (single- or double-optin), you may use the Aweber web form directly on your squeeze page for signing up subscribers (instead of DAP’s “Direct Signup Form”). In both cases, they will be redirected to the DAP Login Form. This way you can redirect users after they complete the Aweber signup, to a landing page of your choice. DAP has a feature where if a user logs in from more IP addresses than what you’ve configured as DAP Admin (default: 5) under “Setup > Config > Advanced > Max. # of User Logins From Different IP’s” , then the user’s account automatically gets “Locked”, and both the user and you (the admin) will get an email notifying you that the user’s account has been locked. You could then unlock them yourself, or wait for the user to send you an email and ask to be unlocked. Next to user’s name, you should see a button called “Unlock User” (you will see this only if the status of the user is “Locked”, and won’t see it for other regular users). Click on the “Unlock User” button. That’s it. When you click the “Unlock User” button, the user’s login records are deleted, and the previously recorded IP addresses are deleted. So user basically starts with a fresh, new login count. TIP: If your users are getting locked out too frequently, and you don’t want the hassle of unlocking them regularly, simply set the count to a higher number – like 20. Or you can also disable login IP check for individual users, or for your entire web site as a whole. UPDATE April 2, 2015: Starting DAP 4.8, DAP now integrates with Aweber via their API. UPDATE July 23, 2014: The DAP-to-Aweber integration below has slightly changed – the documentation below has already been updated with the new information. The flow of subscriber in this model, is “FROM DAP TO Aweber“. User signs up at DAP first, then DAP adds her to Aweber. If you are looking for the other way, i.e, “FROM Aweber TO DAP”, then click here. When DAP adds a subscriber to your Aweber list, it can currently “send” only the user’s Name and Email address to Aweber. DAP cannot (and does not) send the user’s unique password in DAP, or their affiliate id, etc. If you want Aweber to send out the password, then here’s how you can do it. With the “DigitalAccessPass.com” Aweber Email Parser, integrating DAP with Aweber is a total breeze. 1. Login to your account at Aweber.com and from the “Current List” drop-down, pick the list to which you want DAP to add users to. That’s it for the Email Parser activation at Aweber. You will be shown something like the image below – but note that there is no “Final Step”. So nothing further to do on this Aweber page. This step is where things changed on Aweber’s end sometime in June/July 2014. 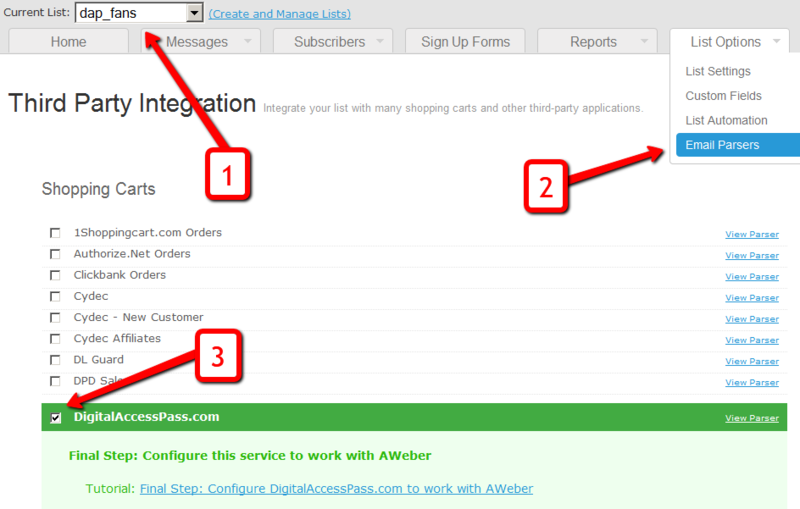 So if you previously performed this step and your Aweber integration has stopped working, please double-check the steps here. 5. Go back to Aweber and select the right list. Then, under List Options > List Settings, under “Basic Information” section, you’ll see “List Name” and right below that, you’ll see “Unique List ID“. In the image below, both appear to be the same. But on most Aweber accounts, especially new lists recently created, these may not be the same. Add the text “@aweber.com” to the end of that text – that now becomes your “Aweber List Email”. So if your list’s unique list id is “dap_fans”, then your Aweber List Email becomes “dap_fans@aweber.com”. Copy this, go to the DAP Products > Manage page, and under the “Notifications” tab, add this Aweber List Email to the “3rd Party Notification” field, and save. So let’s say you picked the list “dap_fans” in your Aweber account, and the DAP Product “Example Subscription Product” (as shown in the screenshots above). And because you have already activated the DigitalAccessPass.com parser in your “dap_fans” list, Aweber automatically adds “Joe Subscriber” with the email id (Joe@Subscriber.com) to your dap_fans list. And the parser has been written in such a way, that the product name will be used as your “Ad Tracking” field for the subscriber. So you will be able to group them and run reports on them in your Aweber account. Q: If I integrate DAP with Aweber and someone signs up to my membership site and then later on cancels or stops paying, can DAP automatically remove people from Aweber? A: Short answer: No. Aweber doesn’t have a “Remove” parser, only an “Add” parser. So if someone who DAP automatically added to your Aweber list when they purchased a product, cancels or asks for a refund, you will have to manually remove them from the Aweber list. But wait, this may not be such a bad thing after all. ExtraTip: As soon as someone cancels their subscription (or just doesn’t pay, or their credit card is declined), then their membership account in DAP automatically expires. Which means they can no longer access any content (unless you have specifically set DAP Config to deliberately give ex-members access to content that they paid for previously when they were a member). So that means, their access in DAP has expired, but they are still on your Aweber list. This may not be bad, because if you keep sending them emails (through Aweber) about new content and new videos and new stuff you are adding to your membership site even after they’ve cancelled, when they come back to your site through the link in your email, they won’t be able to access the actual content. So it’s a great way of continuing to keep even ex-members curious and coming back to the site, only to be presented with a “Sorry, you don’t have access to this”, which may be a great incentive for them to come back and join your web site. Of course, for this to work, you must put all the key content on your web site, and use the emails just to get them curious about the content, and eventually bring them back to the site to deliver the content. However, if you are going to send out all the good stuff in your emails (which doesn’t make sense anyway) then this may be an issue for you. Q) Will DAP add only paid customers to Aweber? Or both Paid and Free members? The link is really between the DAP Product and your Aweber List. So regardless of who gets access to that product – for free, by paying, or admin added – they will automatically be added to your Aweber list. So if you don’t want your free members to be added to your Aweber list, then keep your “Free” products and your “Paid’ products separate, and don’t set up this integration for the Free products. Q) I have a question about how Aweber integrates with DAP. In this instance i am selling a monthly and yearly membership. The reader clicks on the subscribe button on my sales page and gets taken to Paypal. Assuming i have integrated Aweber properly, does the person get added to my Aweber List as well as the DAP list? Or is the only way they get added to Aweber is through a webform? I would like to be able to email the subscribers from time to time through Aweber but i am not using a Web form on my sales page, only a subscribe paypal button. 1) User pays via Paypal. 2) Paypal notifies DAP (ofcourse you need to integrate Paypal with DAP first either using Paypal hosted buttons (http://www.digitalaccesspass.com/doc/setting-up-your-paypal-button-and-paypal-ipn/) or using DAP generated button for paypal (http://www.digitalaccesspass.com/blog/2010/12/dap-v4-0/). 3) If the Paypal payment was successful, DAP creates the membership account and sends out the thankyou email to user with their membership login info (you can configure thankyou/welcome in the DAP products page). 5) After DAP adds the user to purchased product, it sends out notifications to all email Ids listed in the 3rd party notification id field for that product. Here’s more info on how to integrate DAP -> Aweber for paid products. Make sure to login to your Aweber account, Click on Ã¢â‚¬Å“My ListsÃ¢â‚¬Â and within that, select Ã¢â‚¬Å“Email ParserÃ¢â‚¬Â. On the Email Parsers page, check the check-box next to the parser named Ã¢â‚¬Å“DigitalAccessPass.comÃ¢â‚¬Â as described above in this post.